Data is from the January 2018 Salesforce "Connected Audience Report." 3,080 internet users ages 18-97 from Australia, Canada, France, Germany, Ireland, Japan, the Netherlands, New Zealand, the UK and the US were surveyed online in October 2017. 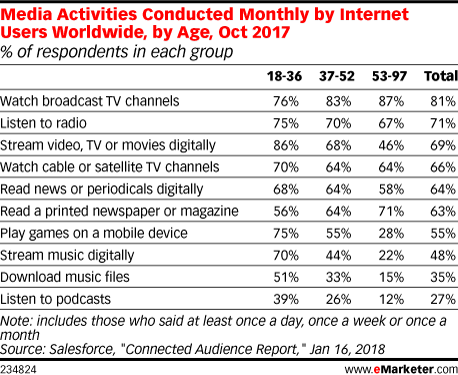 Respondents met the criteria of consuming video media (streaming, broadcast TV or cable/satellite TV) and audio media (streaming, radio or podcast) at least once a month. The data has been weighted based on country population size.